An F-35A Lightning II entered the Benefield Anechoic Facility for the first time Sept. 14. The aircraft is undergoing Electromagnetic Environmental Effects testing, called E3 or “Triple E” by the team. The testing is scheduled to last until Nov. 14 and will allow the JSF Program Office to sign off on verification on military electromagnetic standards. The verification is a requirement to begin initial operational capability testing of the F-35A with its Block 3i software and final use of the Block 3F software. There are three variants of the F-35 used by the Air Force (F-35A), Marines (F-35B), and Navy (F-35C). Each variant is using a unique block of software to begin their IOC testing. “The Marines just recently did [IOC] with Block 2B software and the Air Force is about to do it within the next year with 3i software. The Navy is going to do it with 3F software and that’s the software that’s on the jet, but it’s an Air Force jet that’s in the chamber,” said Andrew Corp, JSF Electronic Warfare engineer. The BAF is the largest known anechoic facility chamber in the world. It is populated with radar absorbent material to simulate a clean RF environment. The chamber provides RF shielding from outside interference and at the same time contains RF interference inside the chamber from leaking outside. It allows jets, like the F-35, to be isolated from the outside world to ensure that the tests are only collecting data from the components on the jet and not spurious RF noises in the environment. Since the F-35’s visit is a first for the BAF, the chamber had to undergo some modernization efforts, which included the power system to the jet and the cooling system. The upgrades took around six months to complete. Once in the chamber, the crew was able to test it in a range of configurations including suspended in a sling 35-feet off the ground. 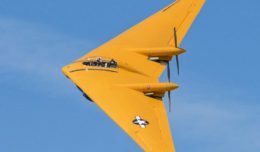 “It is very unique; we’ve mostly done fourth generation aircraft and there’s been a learning curve associated with bringing in a fifth generation aircraft,” said 2nd Lt. Isaac Ramirez, 772nd Test Squadron BAF project manager. The test team has around 70 members including maintainers and F-35 cockpit operators. The cockpit operators are not pilots, but JSF test engineers who sit in the aircraft for most of the testing to operate the aircraft systems. According to Ramirez and Schiffer, the test is also unique in that they are interfacing with more than one customer. This particular test is being conducted jointly between the F-35 Lightning II Joint Program Office, the 461st Flight Test Squadron, 772nd TS, Naval Air Warfare Center Aircraft Division, and Lockheed Martin. Ramirez, who manages the BAF’s schedule, said they have increased their operations tempo this past year with the F-35A coming in as the fifth test project so far. Prior to the F-35A’s arrival, the BAF hosted a Navy program, an Air Force program and one foreign military sales customer. “A lot of what we do here, we provide the eyes of the aircraft. Electronic warfare is growing in importance because there’s a lot of things that allow us to be better in fighting wars, to detect enemies from very far away before they can detect us,” said Ramirez.